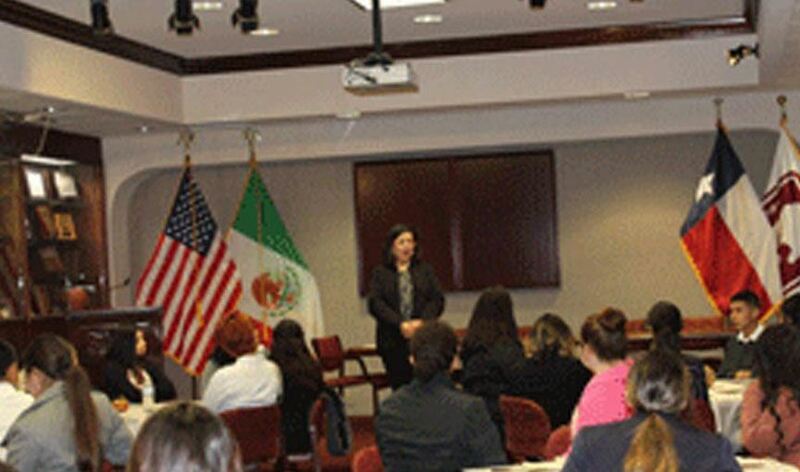 (November 27, 2018) LAREDO, TEXAS - This month, IBC Bank employees hosted 71 free financial literacy presentations in celebration of Get Smart About Credit Day. The presentations reached 2,490 students and adults in the 90 communities that IBC Bank serves in Oklahoma and Texas. "Financial literacy is a critical life skill that is essential to the success of individuals and communities," explains Dennis E. Nixon, Chairman and CEO of IBC Bank. "IBC's efforts to bridge the financial literacy gap facing our country is ongoing, but we are particularly proud to participate in the national Get Smart About Credit observance." Texas ranks 33rd and Oklahoma 47th out of the 50 states, plus the District of Columbia, in a ranking of residents' financial savvy according to a recent survey by WalletHub. The rankings were based on 24 metrics that represent financial literacy, ranging from foreclosure rates, to the number of households without a bank, to the percentage of adults without an emergency fund. "At IBC Bank, we believe that the banking industry has the duty to provide financial education tools and resources so that the communities we serve can compete in the ever-changing competitive global economy," explained Nixon. IBC Bank's commitment to "Do More" in the communities they serve can be seen in their ongoing efforts to provide financial literacy training to school-aged children, adults and senior citizens. IBC believes in the importance and power of education and understands that the sooner individuals adopt good financial habits, the better chance they will have of leading stable and successful financial lives. The Get Smart About Credit program, sponsored by the American Bankers Association (ABA) Community Engagement Foundation, is a national campaign of volunteer bankers who work with young adults to raise awareness about the importance of using credit wisely. This year, approximately 6,300 bankers from more than 340 banks across the country participated in the 16th annual Get Smart About Credit campaign. IBC Bank and Commerce Bank are divisions of International Bancshares Corporation (NASDAQ: IBOC), a $12.0 billion multi-bank financial holding company headquartered in Laredo, Texas, with 188 facilities and more than 289 ATMs serving 90 communities in Texas and Oklahoma. In 2016, IBC celebrated its 50th anniversary since opening its doors for business in 1966. IBC Bank's slogan "We Do More" reflects the bank's dedication to the growth and success of both the customers and the communities it serves. International Bancshares was ranked 19th on Forbes' prestigious list of 100 Best Banks in America in 2018. MEMBER FDIC / INTERNATIONAL BANCSHARES CORPORATION. Follow our Facebook page, @IBCBankWeDoMore. More information is available at ibc.com.